Co-signing a loan agreement should never be undertaken lightly. Becoming a co-signer does come with certain financial risks and can bring problems when borrowing in the future. What Does Co-signing a Loan Agreement Mean? When a person co-signs a loan agreement it means they are accepting responsibility for the loan on behalf of another person. The original loan applicant may have been turned down due to poor credit references or there may be a requirement for a co-signer due to age restrictions. The co-signer is basically accepting responsibility for the loan if the original applicant defaults on the loan. This could mean that the co-signer will be required to pay the loan in full if the original applicant does not maintain regular payments. Offering to become a co-signer can be a generous act but it does come with certain risks. There are many different types of loans that more that one person can accept responsibility for. Mortgage loans are often co-signed by two or even more people who wish to buy a property. Credit cards accounts can often be joint accounts in the husband and wife’s names. Personal loans for young people and students will often require a guarantor or co-signatory. All of these joint agreements do carry some form of risk and responsibility for those involved in the financial agreement. One of the main risks of co-signing a loan agreement for someone else is the responsibility that is involved. If the original applicant does not keep up with repayments then the co-signer will be liable for payments. This could mean that the co-signer will be requested to pay the balance of the account in full plus any additional interest fees and charges. If the original applicant cannot repay or disappears then the co-signer will be left with the responsibility of paying this loan. This is not an uncommon problem, and many people, especially parents, who co-sign a loan often find themselves in this difficulty. Another major problem when co-signing a loan is that this loan will be marked down on credit references. It only takes one or two missed payments to suddenly bring an excellent credit record down to a poor credit record. It can be very difficult for co-signers to receive reasonable interest deals on future loans and credit agreements with a poor credit references. 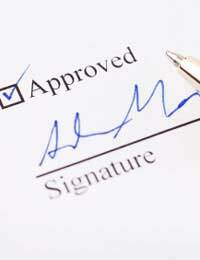 Becoming a co-signer on a loan or any other financial agreement should not be taken lightly. A poor credit record and repaying another person’s debt can be the outcome of generously co-signing for another person. Why does the original applicant need a co-signer? Is the original loan applicant already heavily in debt? Does the original applicant have a history of debt problems? Does the original applicant have the resources to pay the loan repayments in full every month? Is the original applicant a responsible person? Is this a long term debt over the course of many years? Is this debt to be secured on any property? Has payment protection insurance (PPI) been applied to this loan? If the worst does happen and a co-signer is asked to repay a debt they should try to negotiate with the lenders. Negotiating with lenders may mean the lenders will accept a reduced final settlement. This won’t always work but in many cases lenders will accept a reduced amount rather than sell the debt on to collection agencies. If the lender does accept a lower amount always obtain this agreement in writing. It is also a good idea to ensure that the debt settlement is recorded on the co-signers credit reference. There are times when co-signing a loan will be the right choice to make, such a joint mortgage account. But co-signing personal loans for others can be an extremely risky proposition. No matter how financially sound or responsibly minded the original applicant might appear, situations can change. Losing a job, a drop in income and redundancy can all happen suddenly, and loans repayments are often the first financial responsibilities to suffer. Anyone considering co-signing for another person should seriously consider the consequences.